I received another package from my incredible secret pal yesterday. She made me a fuzzy pair of gauntlets, that I have already made use out of. 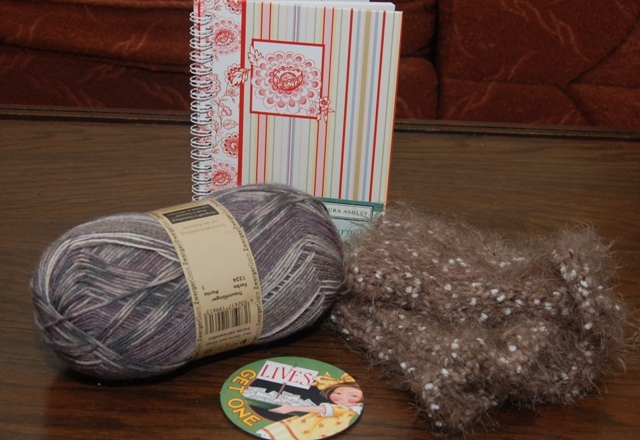 She also included a little journal, a magnet, and a beautiful ball of sock yarn that I can't wait to knit up. I have been really good about not stashing yarn, but somehow I have accumulated enough sock yarn for six pairs of socks. I was trying to hold off on the sock knitting until the summer when I want more portable projects, but I might have to add a pair of socks to my current queue. Then, if one package wasn't enough, my coworkers ordered me a box of vegan goodies from Pangea for my birthday. 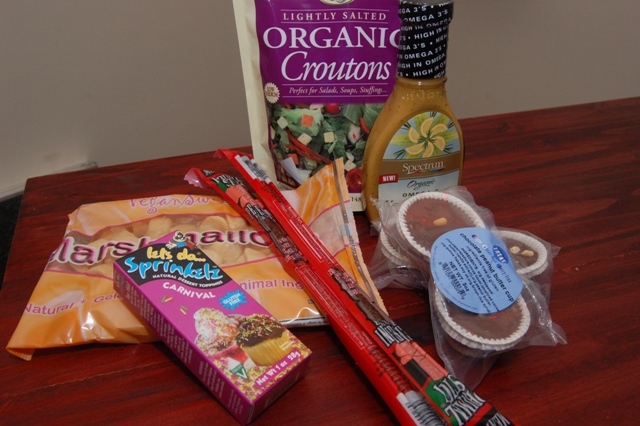 They sent vegan jerky, peanut butter cups, Caesar salad dressing, organic croutons, marshmallows, and sprinkles. I used the salad dressing on my salad last night and it was delicious. In spinning news I now have 4 skeins of handspun complete (and more plyed yarn that needs to be set.) I am going to try spinning the ingeo fiber I have this weekend; I have been saving it since I wanted to feel pretty confident in my spinning before I attempted using the expensive stuff. I will post the results, good or bad. In honor of the cold weather I am going to do something that I haven't done in quite awhile, I am going to post a recipe. Chai tea is my favorite thing in the world to drink when it is cold outside so here is the recipe that I use when I am on the go. Squirt the agave nectar in the bottom of a large coffee cup. Then fill the mug 3/4 of the way full with very hot water. Add the teabag and let seep for 3-4 minutes. Remove the teabag and fill the rest of the mug with Vanilla soymilk. Stir and enjoy. Why agave? In my opinion, agave nectar is the best thing to happen to tea since the teabag. While it has a very similar flavor to honey, it is thinner so it dissolves more readily in hot and cold liquids and it never crystallizes. The fact that it was never spit out of a bee's mouth is just an added bonus. we need to order from that place you were telling me about. the one with the "ribs" and such. Thank you for the chai recipe; it is a favorite in this house. I love agave nectar too, although I have to say rice nectar is my favorite honey substitute. It really does taste like honey! Although it doesn't have that thin factor like agave nectar, I still find it dissolves easily. Alas, I can only get it in Seattle or online, so agave nectar is just fine when I'm local.